Here is David thanking god for victory. He is certain that he won in battle because Yawheh was on his side. But in v 8-12, he is right back obsessing on the gory details of the violence and vengeance that Yahweh will inflict on his enemies. This one starts out with “My God, my God, why hast thou forsaken me?” Heard that before? (if not, see Matthew 27:46). I’m gonna guess that David has just lost in battle, and he’s pouting and whining. And it’s bad; in v 14 he makes it sound like he’s dying. This verse is also very familiar to me. In fact, so familiar that I was sure it was another parallel to a New Testament verse, but I couldn’t find it in the NT. 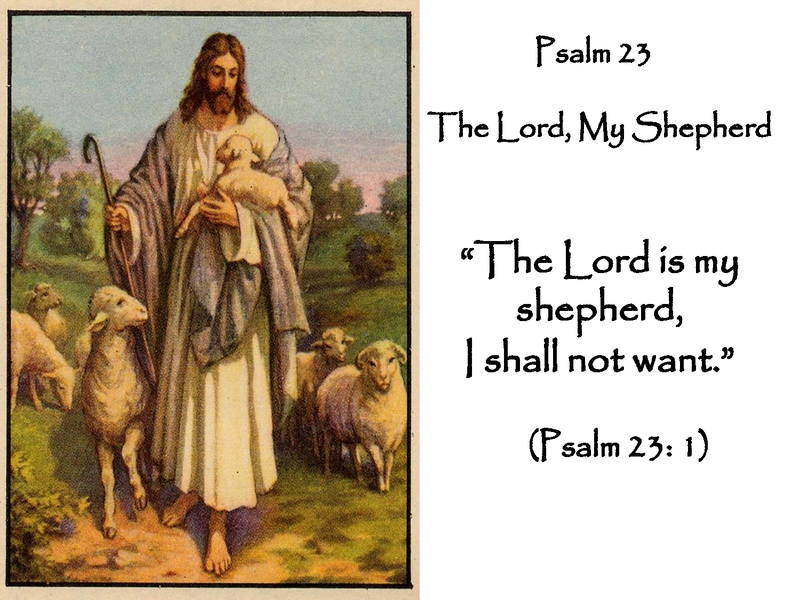 However, I found Psalm 22 in the Revised Common Lectionary for Good Friday. Bingo! Christians are big on connecting OT passages with Jesus. In context, it clearly has nothing to do with Jesus; the two passages were linked after the fact. Make sure to read the whole thing for more parallels – “they have pieced my feet” (v 16); “They divide my garments among themselves and throw dice for my clothing.” (v 18). Wow – I wonder what Matthew was reading before he wrote his gospel? This is the biggie. The Best Known Psalm of all time. You’ve gotta have heard this one! Make sure to read the KJV – that’s the familiar lingo. 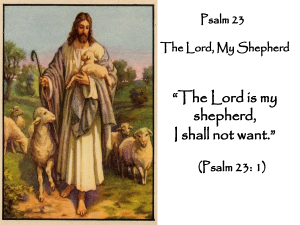 This psalm projects the ‘gentle Jesus, meek and mild’ image that children learn about. It’s usually illustrated with pictures of Jesus holding a shepherd’s crook with a flock of sheep in the background, or Jesus holding a little lamb – that’s what I remember from my children’s bible. But wait – this is the OT – it isn’t about Jesus at all! Another example of linking passages after the fact. That’s kind of deceitful, isn’t it? This psalm is also tailor-made for biblical cherry-pickers to set to music. The most famous version is arguably Crimond. My mother played it beautifully on the organ and I have sung it so many times in church choir that I still know it by memory. Even now, hearing it conjures up warm fuzzy memories and brings tears of nostalgia to my eyes. The descant on the last verse is so glorious! We’re back to smarmy praise and pre-scientific thinking. David is sucking up to Yahweh again. Yawn.